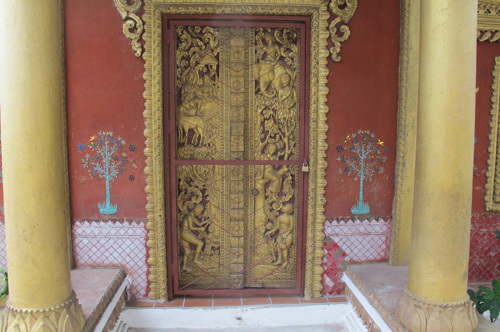 The important temple of Vat Souvannakhili lies in the heart of Luang Prabang's historic Peninsula in close proximity to Vat Xiang Thong and Vat Pak Khan. 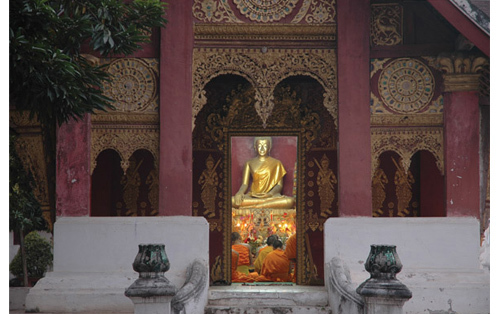 It holds a special place in the pantheon of Luang Prabang's Buddhism, largely due to the revered monk Pha Khamfan Silasangvaro, an intellectual, writer, artist and architect who was Abbot of Vat Khili from 1931 until his death in 1987. 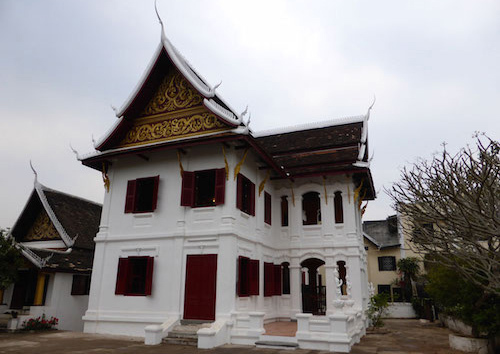 Today the temple hosts the Buddhist Archives of Luang Prabang in the imposing two storey Sala Thammaviharn; a memorial exhibition to Pha Khamfan on display in the charming traditional library building; an historic manuscript storage chapel and an important exhibition on Meditation in Luang Prabang. The Sim, or chapel, was restored in 2005 by the Japanese architect Yushi Kawaguchi under the aegis of the UNESCO World Heritage office, and the roof structure of the living quarters of the novices was replaced through a private initiative in 2010. 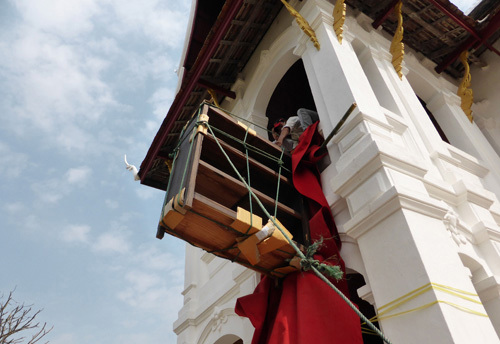 By the end of 2013 however it was clear that the expanding research and archival works of the Buddhist Archives mandated an urgent need for renovation of the Sala Thammaviharn and several other storage and work spaces. Thanks to the Badur Foundation of London, the U.S. Ambassadors' Fund for Cultural Preservation and a number of private donors, extensive restorations were carried out in 2014 and 2015, providing secure functional spaces for the Archive and adequate cabinetry, shelving and storage. Additional sanitary facilities for the novices were also included in these works, as was a complete refurbishment of the temple grounds and landscaping. Please scroll through the images below to see the results of the Vat Khili restoration. The facade of the Sim at Vat Suvannakhili. the monks and novices have just begun their evening prayers and chanting. 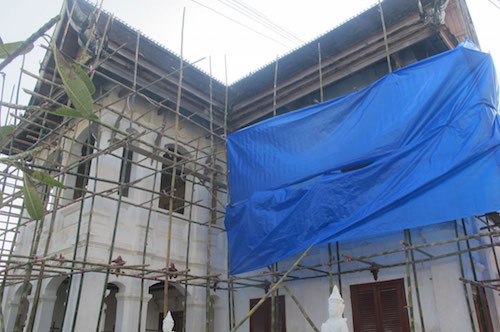 The sala Thammaviharn at Vat Suvannakhili, which houses the Buddhist Archives and the Meditation Exhibition, covered with scaffolding as the restoration work begins. 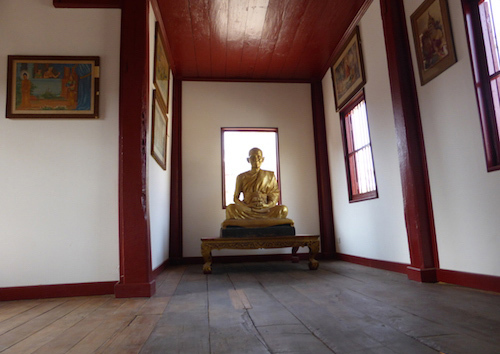 The Sala Thammaviharn following the complete interior and exterior restoration. 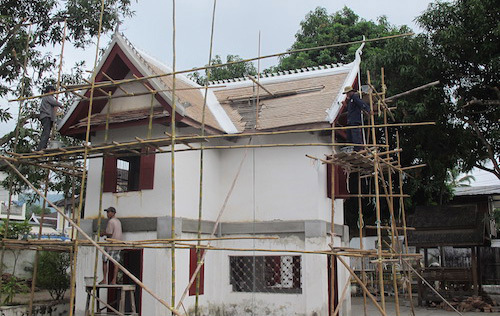 The charming 200 year old Library building at Vat Khili was also part of the restoration plan. It was restored and devoted to an exhibition honouring the former Abbot of the Temple, the late Satthu Khamfan Silasangvaro, a widely respected scholar, teacher, artist and photographer. The restored interior of the fomer Library building, now an exhibition in honour of Satthu Khamfan, showing some of his work and related materials. 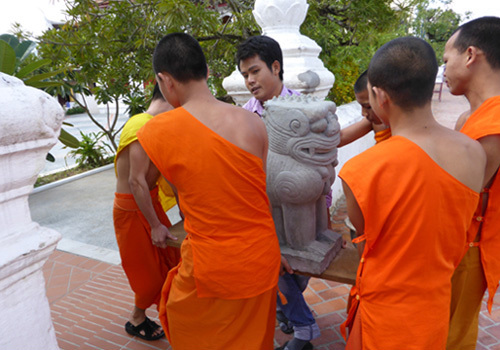 Novices from Vat Khili and Projet staff struggle to carry a newly cast ceremonial Lion, to guard the entrance to the Temple grounds; made to replace one long missing. 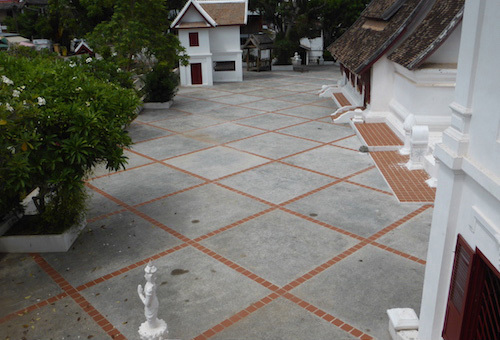 Viewed from the Archives' balcony, the geometric grid of the newly installed Macadam in the Temple grounds is precisely aligned with the axis and geometry of the Sim. This charmingly decorated small building on the Temple grounds was originally intended as a manuscript library, but fell into disuse. During the restoration the building has been restored for use as originally intended. 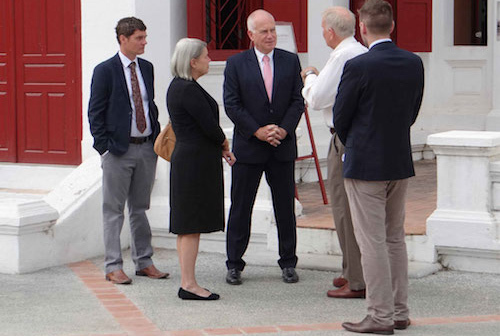 The U.S Ambassadors Fund for Cultural Presevation gave a generous grant to the Project for use at the Archives in Vat Khili. Here in front of the Archivie building, the Project Coordinator speaks with U.S. Ambassador Daniel A. Clune, Mrs. Clune and senior U.S. Embassy staff. The heavy cabinets funded by the U.S. Ambassador's Fund could not be taken into the Archive up the narrow old starcase, thus the Project staff performs the Heculean task of manually hauling them up over the balcony. 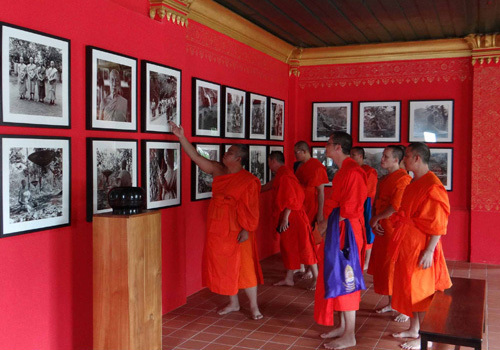 In the Meditation Exhibition on the ground floor of the Archive building, the Chairman of our Project and Buddhist Sangkha of Luang Prabang, Satthu Nyai One Keo gives a group of important Vientiane monks a guided tour.